The short film "Das Haus" is a hand drawn animation in classical style of about 7 minutes, drawn 24 frames per second with pencil on paper and coloured in aquarelle. To create the 3D rotating space with permanent tracking camera the idea was to combine 2D drawn and water coloured animation with 3D animation with hand coloured aquarelle mappings for the backgrounds. 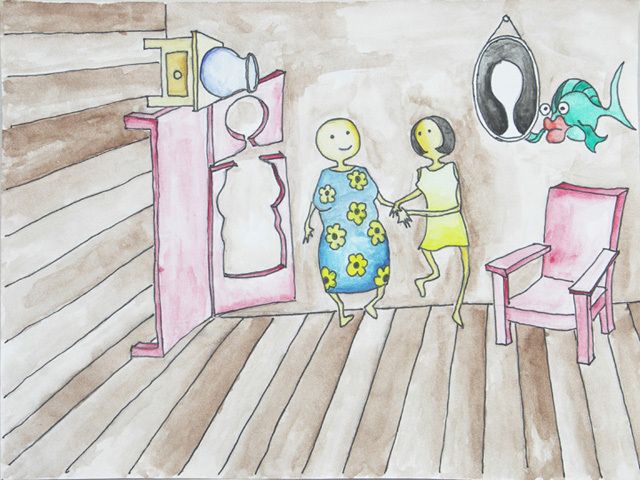 The story centered around the main character the little girl, her grandma, the aunt and her mother happens exclusively in the "House", existing of 5 different rooms. You can understand the house as a box, which four sides define each a different room, coming to life due to the rotation of the box while the protagonists are entering the next rooms respectively climbing up the wall the box is turning. Plus a fifth room outside the box as the beginning of the story and the possible way out of the closed system at the end. Beside of the family of 4 women there are two pets in the house, a fish and a bird, helping the little girl till the end, escaping as the only survivors.